"My goal for 2010 is to use up my all stash. 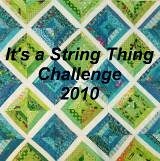 And what a better way than to make string quilts, so I joined the string quilt challenge. I loved using Stacey's method of telephone books pages it was much easier than other ways I have tried to make string quilts. This one I made is not color control but I love the way the different colors compliment each other. 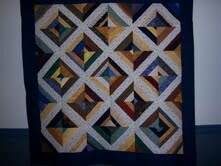 This quilt will be giving to a children's charity".